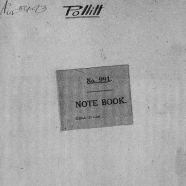 Includes HP's prison notebook with notes on books read, French exercises, sketch 'After a Job', etc. ; letters (5) to Marjorie Pollitt; letter (photocopy) to his mother Mary Louisa Pollitt from Brixton prison 26.11.25. Includes 'Mr.Amery's Indian Record' and a letter from Amery.